The Evaclite sign retains all the Familiar properties of a standard ‘passive’ illuminated sign, complying to EN60598-2-22 & BS5266-1. Signal from fire panel to evacuate, all available ‘safe’ exits are made dynamic with a green pulsing arrow within the pictogram arrow. Signal from fire panel to evacuate, all unsafe exits display the red cross through the Evaclite sign. When it comes to the safety of your building, employees and visitors, specifying a tried and tested evacuation system sits right at the heart of any Fire Risk Assessment and Fire Designed Engineered Strategy. It is possible to design a building to comply with standard codes of practice, but this won’t always result in the most efficient and safer evacuation methods for complex buildings. Fire design engineering will often be the only way of providing a solution that meets the complexity of the building whilst satisfying the original architectural aspirations. FE is not just about compliance with a set of prescriptive codes of practice, it is about developing performance based solutions that are safer and cost effective without having to change the original design whilst still suited to the building architecture. This is why specifiers around the world are choosing the Evaclite approach to emergency exit signage as part of their Fire design engineered strategy. Bringing a decade of research and development into dynamic emergency exit signage, Evaclite can now provide a safer evacuation in conjunction with your buildings fire alarm panel, providing adaptability in real time. In an emergency ‘every second counts’. Evaclite’s dynamic signs have been proven to facilitate a safer evacuation during an emergency. The signs attract the eye and provide a dynamic pulsing array of light within the emergency luminaire. Being intuitive the signs are easily understood by all languages. The 3x pulsing array only activates when the alarm has sounded, ensuring that building occupants will not become too familiar with the concept and thus reducing the likelihood of learned irrelevance. The enhanced design also has the advantage of being fail-safe – if the LEDs failed to operate, the sign would remain compliant, as a standard passive emergency exit sign. Passive or static fire exit signage can create bottlenecks during an evacuation and, worse case, can actually lead people towards the hazard. As part of our research and development with a team of leading academics and industry experts we conducted full scale trials using the Evaclite Dynamic Signage and the results showed 2 x faster detection of the signs and 3 x quicker decision making. Evaclite Dynamic Emergency Exit Signage can help with evacuation processes in any emergency situation be that fire, terrorism, security breach, suspect package, adverse/severe weather, and normal evacuation drills. Evaclite’s exit signs are further enhanced with an adaptive ‘red cross’ which activates upon receiving a signal from a nearby fire alarm device or panel. You can connect to a fire panel such as Advanced, or via Apollo XP95 I/O interfaces or Sounder control Unit, or any appropriate relay from your preferred panel supplier. Using Cause and Effect programming of the panel, detectors will signal which zones of a building are potentially hazardous, these can be further evaluated through a combination of data from detectors in the area concerned such as: Optical smoke, Optical smoke/heat, Heat fixed, Rate of rise, Carbon Monoxide, Ionisation, Optical Beam, Aspirating, Flame Detection or even a simple activation from a nearby Manual Call Point. Further enhancement can be achieved by integrating with Building Management Systems (BMS) and/or by using CCTV, and the public address/voice alarm system informing people to follow the dynamic green Evaclite Emergency Exit Signs. The dynamic signage can be used to further facilitate your evacuation strategy in terms of ‘one out all out’, phased, staged or progressive horizontal evacuation. 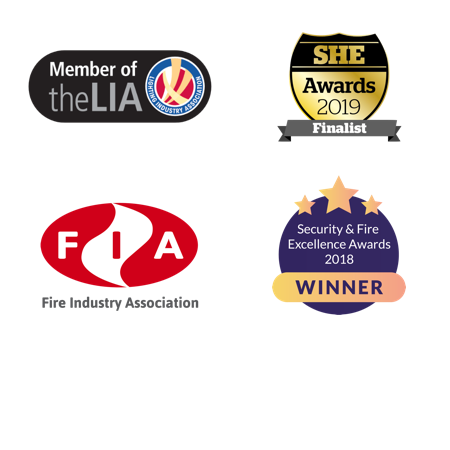 As members of the Fire Industry Association (FIA) we are in general collaboration to help promote and shape further legislation and the professional standards of the fire industry in this technology through close liaison with government and official bodies, as well as other key stakeholders. Evaclite Dynamic & Adaptive Emergency Exit Signs have conventional functionality plus extra performance and styling, provided by the latest Dynamic/Adaptive LED 3PA ‘Blade’ Technology. Long-life low powered LEDs (typically 50,000 hours+), excellent energy efficiency (>100lm/W), low operating temperatures, thereby improving the life of the Nickel Cadmium (NiCd) batteries. A maintained operation as standard providing 3 hour duration. The ADS1 is compliant to BS5266-1 & EN60598.2.22 NB: All main internal wiring is low smoke, zero halogen. Pictograms format compliant to ISO 7010. Recessed for a more attractive installation, adjustable arms simplify installation across different thickness supporting surfaces. The visible plate is powder coated white but other finishes can be applied according to volumes/project requirements. Connectivity: 2 x open relay contacts + compatible with Apollo XP95 type systems with intelligent I/O or Sounder control units. Both input/output units in the enclosure provide supervision of one or more normally open volt free contacts connected to a single pair of cables and a set of changeover relay output contacts.